Every year I promise myself more Christmas themed sewing, and every year I somehow fall short. This year I promised myself at least one finished Christmas quilt top, and given the frenzied pace of life right now, I needed a fast and simple project. 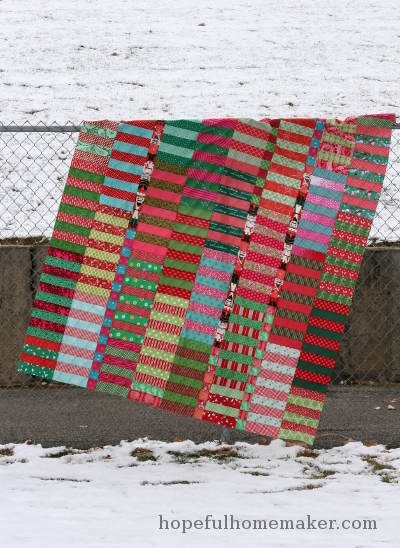 I decided to make a Christmas Color Stack quilt. 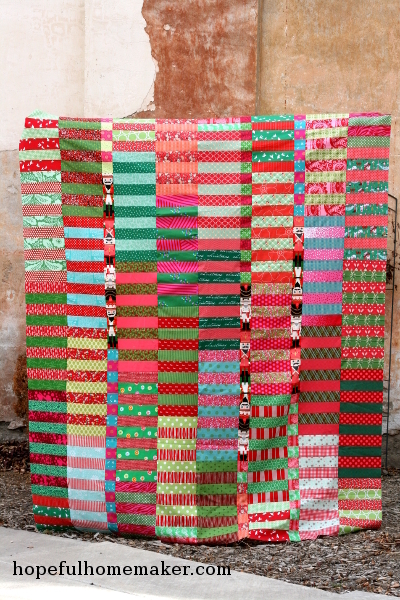 Like my original Color Stack quilt top, I cut strips from my stash to use in this quilt, but it would also look great with a couple of Christmas themed jelly rolls. I chose a variety of reds and greens and added some blue, pink, aqua, and even a bit of orange. 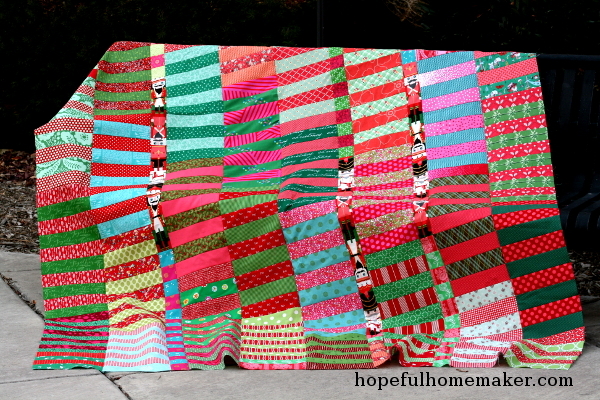 I’m excited to have a colorful, festive quilt to use for the holidays, and I really like the modern vibe. 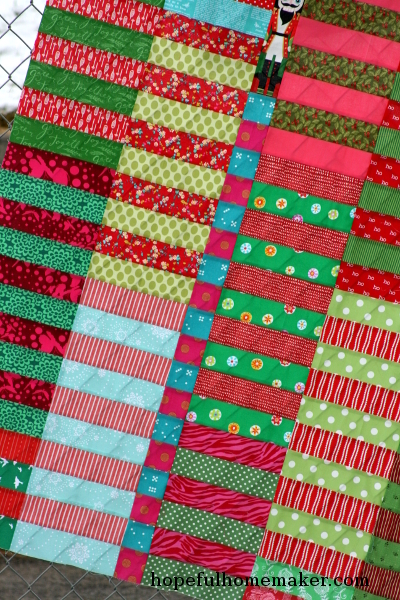 Rather than Christmas themed quilt blocks, it’s a mash-up of holiday colors and it really makes me smile. 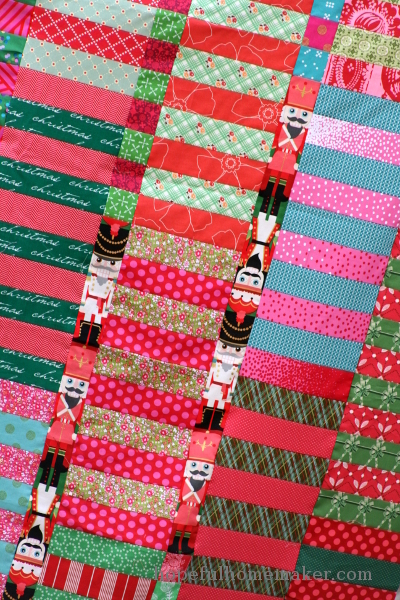 I followed my original design, except in this version of the quilt, instead of piecing the 1.5″ strips in the pattern (available here for only $5), I fussy cut strips of an Alexander Henry nutcracker print that makes me smile. This print will also be the backing for the quilt. *Note: if you’re making a Color Stack quilt and want to do something like this, cut three strips 2.5″ wide by 32.5″ long and insert them in the narrow columns as shown in the pattern. The quilt top measures 66 x 80 inches and because of the simple design, was completed in a couple of afternoons. The backing is pieced (a habit I have – I always piece the backing immediately after finishing a quilt top) and awaiting quilting. I would love to get this finished before Christmas. Yesterday we got our first dusting of snow for the season, and I couldn’t resist going out in the cold to snap a photo against the white backdrop. We’ve had unseasonably warm weather in Utah, so this change in temperature really makes it feel like Christmas is around the corner! If you’re looking for a fast finish, or need to make a quick quilt to gift for the holiday, this pattern is a great place to start. I hope you enjoy it as much as I have!